In this example we see how to robustly fit a line model to faulty data using the RANSAC (random sample consensus) algorithm. Firstly the data are generated by adding a gaussian noise to a linear function. 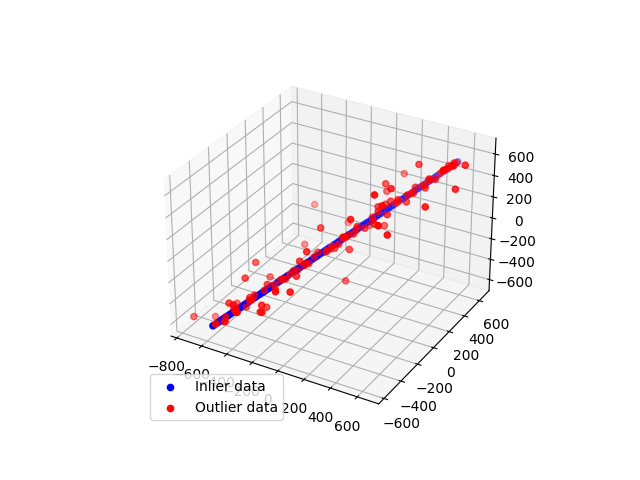 Then, the outlier points are added to the data set. Select min_samples random samples from the original data and check whether the set of data is valid (see is_data_valid option). Estimate a model on the random subset (model_cls.estimate(*data[random_subset]) and check whether the estimated model is valid (see is_model_valid option). 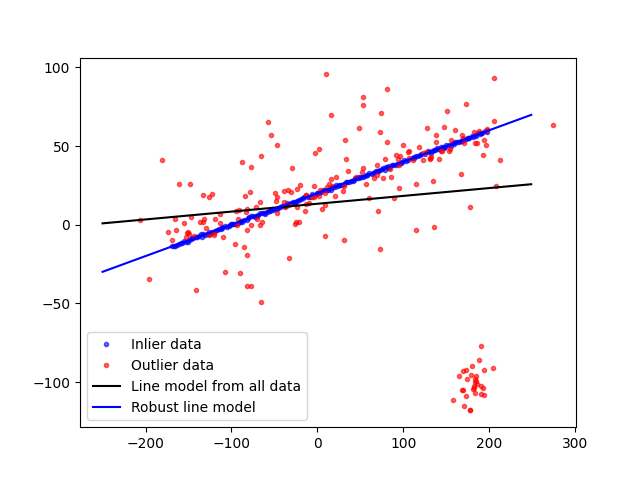 Classify all the data points as either inliers or outliers by calculating the residuals using the estimated model (model_cls.residuals(*data)) - all data samples with residuals smaller than the residual_threshold are considered as inliers. If the number of the inlier samples is greater than ever before, save the estimated model as the best model. In case the current estimated model has the same number of inliers, it is considered as the best model only if the sum of residuals is lower. These steps are performed either a maximum number of times or until one of the special stop criteria are met. The final model is estimated using all the inlier samples of the previously determined best model. Now, we generalize this example to 3D points.